Tired of the traffic on the 4th? We have a wheelie good idea! 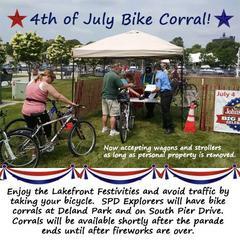 Take your bike & use our bike corrals! They're free! The Sheboygan Police Department invites you to enjoy the festivities at the lakefront again this year on the 4th of July with your friends and family by getting there on your bicycle. There will be two bike corrals supported by officers and members of the Sheboygan Police Department Explorer post where citizens can leave their bicycles and we will watch them for you until you return to go home. One will be at Deland Park next to the war memorial along Broughton Drive. The other will be on South Pier Drive on the west side of the road at the intersection of Lakeview Drive. So come and enjoy the fun knowing that your bike will be kept safe while you are there and avoid the traffic congestion. All we ask in return is that you not leave them in the corrals at the end of the night. The corrals will be available starting shortly after the parade ends and will close shortly after the fireworks are over. *New this year we will also accept wagons and strollers as long as personal property is not left with them.